Babaji has written: We live in the imagination of others. When we see a person, we don’t see the reality of that person – we see only our projected desires, which is our imagination. In this way, as long as we have not yet realized the truth, we all live in the imagination of each other. In our everyday life we identify things as good or bad. If something doesn’t support our ego, the mind labels it as bad, and if it does support our ego the mind says it is good. Our ego, according to its likes and dislikes colours every object, thought or idea and gives judgement accordingly. This is a very simple teaching, yet we’re often not aware that that our response to something is our view and not the truth. In fact it usually seems perfectly obvious to us that our version of reality is true. What can we do? 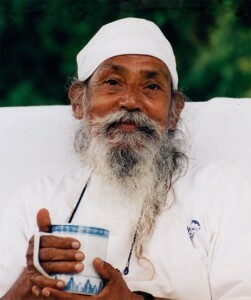 Babaji suggests that we live life in the world as a duty. Duty is one of those words, along with discipline, that is easy to misunderstand because of our associations with it. It is not a heavy-handed dictum; rather, it is a shift from our usual self-centred view of life – changing the angle of the mind – to an open-minded curiosity about what’s best for the whole rather than just for ourselves. Instead of assuming that our opinions are right, we can inquire: Is that really true? I once saw a wonderful bumper sticker that said: You don’t have to believe your thoughts. Babaji reminds us that developing positive qualities is the foundation. Tolerance, compassion and contentment are the three pillars of spirituality. God can’t be seen in a form sitting in heaven but can be experienced by loving every person. Although the habit of blaming others is common, many of us turn the blame against ourselves. “Loving everyone” includes ourselves. How do we develop these qualities.? By learning to notice when we are moving into reactive mode, taking time to centre ourselves, acknowledging that this is challenging for us, and by listening. It takes a lot of practice to be able to have that kind of awareness in heated moments, but we have many opportunities throughout the day to stop and check in with ourselves: Is there tension in my body? Why might that be? It’s really a practice of Svadhyaya, self-study. Swadhyaya is also scriptural study, which reminds us of our aim, of how we want to live. Watching the ego becomes a habit; you have to become as alert as a thief. If we want to be free of suffering, we need to stay true to our aim. We can be serious about our practice, but we needn’t be somber and serious in our lives. As Babaji has told us repeatedly, life is not a burden; we make it a burden. Contributed by Sharada. All quotes in italics are from various writings by Baba Hari Dass. 3 thoughts on "Staying centred in the midst of life’s turmoil"
Always so great to have these reminders and lessons for life…thank you for this gem Babaji and Sharada…..